One of the biggest and sneakiest traps that keeps a lot of solopreneurs struggling to attract clients and make money in their service-based businesses is this: They get caught up in doing a lot of the things that make the smallest difference to their bottom line. It's an easy trap to fall into, especially when you're just starting out. 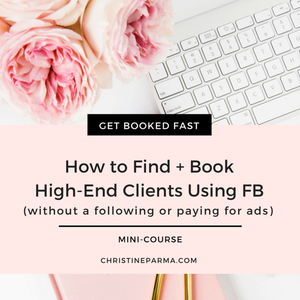 Until you're booking enough clients or filling your signature programs and courses so that you have consistent revenue, it can sure feel like you have to do everything in your business yourself. While it's true that entrepreneurs wear a lot of hats, a lot of time we heap a lot more on our plates than is necessary. It's my goal with this article and the previous one to help you obliterate overwhelm by dramatically cutting down your to-do list in a way that makes sense for your business and personal life. In this previous article, I showed you one strategy for knowing exactly where you're focusing your time, talent and energy for the biggest returns in your solopreneur business. When you use the strategy outlined, you'll get either an answer of "yes, this is a worthwhile activity" or "no, this isn't worthwhile for my business". As a result, your business to-do list should already be significantly shorter. Today we're going to take it up a notch. I'm going to show you how to determine which of the tasks you need to do yourself and which ones you can and should outsource. Plus I'll help you see how you can afford to outsource certain tasks even if you don't think you can right now (and why doing so may make or break your business). Have you fallen into a common solopreneur's trap? Are missing out on booking more clients, making more money and having the kind of business you dream about simply by letting yourself get mired in activities that other people can and should be doing for you? Here’s the truth: a lot of those things you think are critical that you do yourself to book more clients and grow your business probably aren’t. When you think of yourself as “just” a coach, nutritionist, Facebook ads manager or whatever your title is, you can too easily allow yourself to get caught up in serving your clients and the day-to-day administrative tasks that don’t actually result in a steady stream of leads, clients or cash in the bank. Don't help you improve your skill set in the areas that help you get more clients, make more sales and grow your brand awareness. But when you take on the role of the “real CEO” of your business, you focus your time, energy and talent on the big vision for your business and on the areas that make the biggest difference to growth and profitability, which are Marketing + Promotion, Sales and Revenue-Generating Programs + Products and Business Development / Personal Skills Acquisition. All the other stuff – the daily operations, administration, customer service – can and should be delegated to someone else to do. Now, I know when you’re starting out and before you’ve hit a certain income threshold, you may feel like you can’t afford to outsource. Let me help you shift your thinking around that with a simple exercise that will show you exactly what you should be outsourcing in order to bring in more money. While there are certain client-getting and income-producing every business owner needs to be doing on a regular basis (you can grab that list here), the exercise below will help you determine which of the activities in your personal business you can and should outsource now and the dollars-behind-the-reason bottom line. Grab your to-do list and get ready to take a hard look at where you're investing your time (and where it may be smarter to let someone else do things for you). Step 1: How much is a client worth? How much is one client worth to you and your business? You can take the average amount that a client invests to work with you, whether it's through individual coaching sessions, a freelance job or through a paid program or course, for example. Write that amount down on a piece of paper. (If you're just starting out and don't have any clients yet, you can skip to Step 2.) For example, let's say you sell a 3-month coaching program for $2000 per client with no other sales. A client is worth about $2000 to you. Step 2: How much is your time worth? How much is your time worth? To make it easy, think of it as dollars per hour, even if how you get paid isn't according to an hourly wage. For example, if you said in Step 1 that your average client is worth $2000, then divide that amount by the amount of time you invest into that client to come up with your "hourly rate". Of course, there are some nuances here for services rendered through group programs, individual coaching packages that include more than the sessions and so on, but this will give you a rough idea of what dollar value you've placed on your time. To continue with this example, let's say you spend 10 hours preparing for sessions and working with a client over the 3-month coaching program. Your hourly rat is therefore $200. Step 3: How much will it cost to outsource or delegate certain tasks to someone else? Tasks like uploading and scheduling blog and social media posts, creating graphics, replying to routine inquiries, grocery shopping, housekeeping, bookkeeping and the like may be necessary, but they probably aren't something you need to handle yourself. Are you seeing that you spend a great deal of your time on $15 per hour activities instead of the ones that directly contribute to you signing up a $2000 client? Circle those items on your list that you should or would like to outsource or delegate to someone else and write a dollar figure of what it would likely cost to hire someone to do each task for you. Step 4: Which tasks should you outsource first? At this point I bet you're looking at a list of tasks you could outsource for not that big of an investment. But if you have no budget or a very small budget for hiring some help, where do you start? I suggest you start with the easiest task to outsource that will give you the highest return on investment. For many solopreneurs who also take care of many of their household's day-to-day responsibilities, the best investment may be in a housekeeper or personal shopper who can get the groceries and run errands for you if you find yourself doing these kinds of activities at the expense of your work time. Or your best move might be in a virtual assistant who takes care of many of the administrative tasks that need to be done but which don't directly bring clients in the door. While having a housekeeper or virtual assistant may seem like an unnecessary luxury or indulgence, they're not. They're a smart investment in the success of your business when you use the recouped time wisely. f someone else can reasonably take your place and do the task for you and for less money than your time is worth, you should consider letting someone else handle it for you. Even if you only recoup a few hours a week, when you use those hours to focus on the big income-generating activities in your business, you should see a high return on your investment. Step 5: Which tasks should you prioritize for the biggest returns? Now, what's left over? What are the tasks that you've determined you'll still be handling and are they the ones that will help you attract and book clients, create income and grow your business quickly? You can download the free 6-Figure Business Checklist for Coaches, Consultants and Other Service Providers to see if you're focusing your time, talent and energy into the kinds of activities that will make the biggest difference in your business in the shortest amount of time. The activities listed in the checklist help you do three things: attract and book clients, generate income and grow your business. As your business grows and becomes more profitable, you'll want to re-examine which activities you commit to doing personally instead of outsourcing to someone else. Where can you leverage your time even more? Which activities are truly important for you to handle yourself? What will you stop doing immediately or delegate to others? What business-building activities will you focus on during your recouped time? Wondering how you SHOULD be spending your precious time and energy? Get the checklist... Free!